Want to create a travel booking website instantly? 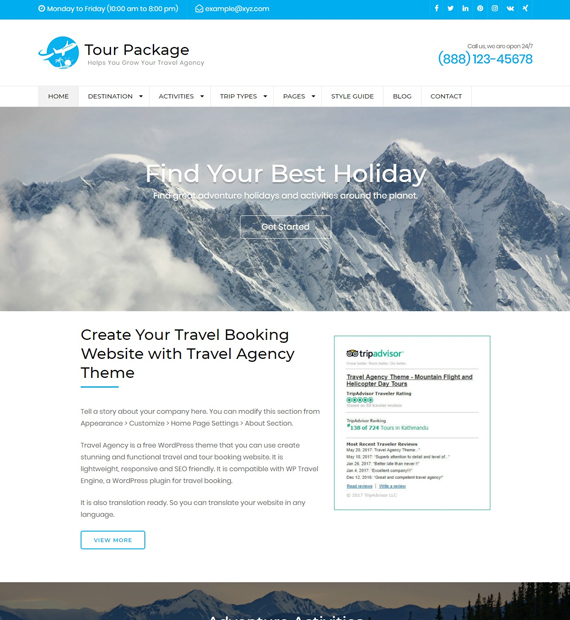 Tour Package, a free multi-purpose, responsive WordPress theme focused on tours and travel businesses, might be the best option for you. With free one-click demo import, you can get a head start in no time. This feature-rich and a highly customizable theme is suitable for travel guides, hotel booking, resort reservation, and tour operators. A few of its outstanding features are showcasing different trips, adventure activities, best selling packages, featured trips, and deals.